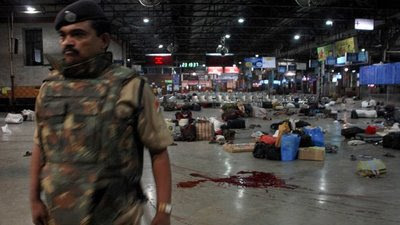 26th of November, 2008 through 28th of November, 2008 terrorists rocked Mumbai. 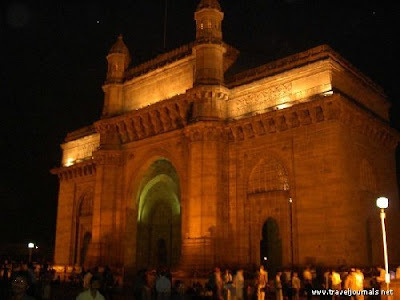 The Gateway of India became the gateway for terror. It all started on a Wednesday, a black Wednesday. 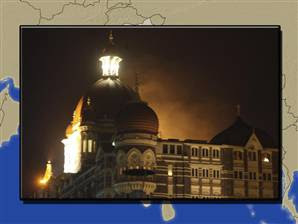 Mumbai was transformed into a battle front. Images that you will associate with a war zone could be relived right here in a metro city. 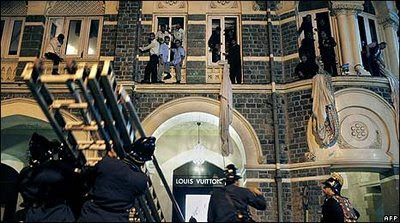 The Taj hotel, the Oberoi- Trident hotel, Leopold Cafe, Nariman house and CST station, all prime locations of Mumbai became the target. Top cops, including chief of ATS Hemant Karkare, encounter specialist Vijay Salaskar and additional commissioner Ashok Kamte laid down their life fighting the terrorists in Wednesday's terror attack. Official figures confirm that 125 people are dead including 14 cops, 6 foreigners and at least 324 are injured. The actual numbers could only be higher. My heart felt commiseration to families of those killed. Terrorists even managed to hijack a police vehicle and shoot at people on Mumbai’s roads. The politicians were quick to condemn the terrorist attacks as they always do. For them it has become a routine task now. I am sure they need not read out those statements these days. They have been making anti-terrorism statements on a regular basis after some or the other part of our country gets attacked. Even when the commandos were involved in fighting the terrorists, these thoughtless politicians decided to pay visit to the city making life difficult for the cops. I strongly condemn the Prime Minister of India, Dr. ManMohan Singh, the Congress President, Sonia Gandhi, opposition leader, L.K. Advani and Gujarat chief minister Narendra Modi for visiting the city when it was still fighting the ruthless terrorists. The cops who were concentrating their efforts in ensuring the security of the people of Mumbai had to divert their attention on VIP security for these politicians. If you cannot help at least don’t harm is what I would like to say to these politicians. You can’t provide security to the citizens of this country and make it difficult for the security agencies involved in fighting the terrorists. I beg of these politicians to wake up and do something stringent. Afzal Guru, a terrorist sentenced to be hanged to death still lives on in the very country that he tried to attack. What more can you say of these politicians who fail to act when they need to? I guess it is only if someone from their clan gets targeted by terrorists that they will think of doing something. I salute our cops, army & navy commandos involved in fighting the terrorists. The firemen too were fighting valiantly to douse the fire that was gulping down the Taj. They are our true heroes. I hope lessons will be learnt and action will be taken to ensure safety and security of our country. I also hope that instead of trying to kick out our own countrymen from one city or the other because they do not originate there, our politicians would focus their attention on weeding out the terrorists from our peace loving nation. I am sure the topic of this post must have baffled you. Isn’t it? If yes, then please don’t be surprised. My journey to office is nothing short of a moon mission like Chandrayaan-I (Indian Space Research Organization’s unmanned moon mission). The only noticeable difference is that mine is a manned mission. Ride to office is a smooth one till I move off Eastern Express Highway and head towards Powai. After getting down from the flyover that crosses over the Gandhinagar junction and moving some distance, I get the feeling how the surface of the moon would be like. A moon mission will be full of surprises. You will not be sure what to expect on the moon. Similarly, my journey with my Uni (My Honda Unicorn) is also full of surprises. 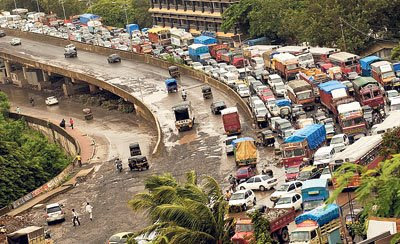 I spend lot of time finding the road amidst pot-holes on one of the busiest stretch in Mumbai connecting the Central suburbs to the Western suburbs. Currently the road widening project is in progress; however, what rattles me is the condition of the existing road. A road that leads to IIT Powai, one of the premier technical institutes of our country is in dire states. Loose cables lie around on the road. Pot-holes compete with each other to find out who is the big daddy out there. I think the government is preparing citizens of Mumbai and its suburbs to take up adventure sports. We spend lot of time travelling to office and hence do not get enough time to spend on adventure sports. Our government is providing us dangerous roads so that our journey is an adventurous one. You will not know when your vehicle will hit a pot-hole. The surprise element will get you the adrenaline rush that is unparallel. 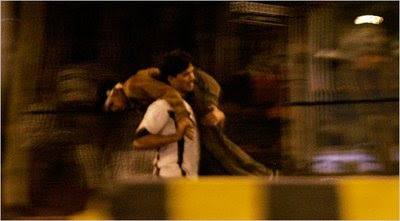 Come night time and the element of risk involved increases and so does the adrenaline rush. Missing street-lights add to the difficulty level. No video game can give you the thrill. The tax payers of this country will not get better value for their money. Why go to amusement parks when you get all the amusement just travelling on the road? The traffic jam at this stretch of road ensures that you squeeze out maximum entertainment. I express my gratitude towards the government establishment responsible for this stretch of road. I would request them to continue spending tax payer’s money in pot-hole maintenance and in ensuring that no street light functions. Any contractor found filling up pot-holes or repairing street-lights should be held accountable and severely punished. I hope I will get to enjoy a simulated journey through the moon till I am in a position to embark on an actual moon mission someday. I had not published a post on my blog for quite sometime. I did contemplate writing about the tension created by a political party by targeting a section of society because of the state they originate from. I decided against it because I thought these politicians get too much attention than what they deserve. Also, I wanted to write something positive, something inspiring and that’s when I thought about writing about a recently watched youtube video on Orkut (a social networking site) in one of my cousin’s video collection. I could not resist myself from adding this video to my video collection too. 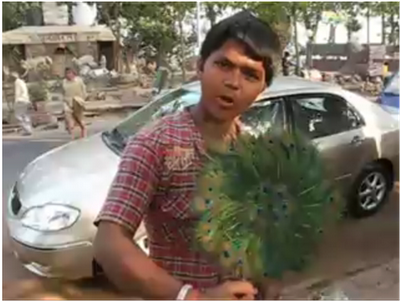 This post and the video that I am referring to, is about Ravi - a boy who sells stuff on the street. Now that you have watched these videos I am sure you will by mighty impressed with Ravi. I was impressed and inspired by him. A kid who has not been to school manages to speak so many languages. Languages like French, Italian, Spanish, Arabic, Iranian and some other languages too. He learnt those many languages by listening and observing the tourists who visit Mumbai. I can’t figure out how he could have managed to learn so many languages in the process of selling stuff on the street. He started selling stuff on the road when he was a 5 year old kid. That age when kids are supposed to be in schools. He is so confident when talking to a stranger. I know the English that he is speaking in the video is not grammatically perfect. This is the very fact that I like about him. He does not care whether he is perfect. Maybe because he doesn’t know that he is making mistakes. Whatever maybe the reason, I learnt from these videos on him that it is not always important to achieve perfection in life. Sometimes just being effective is enough. He also teaches you that whatever you do, do it with conviction. The videos highlight the fact that learning need not necessarily happen within the four walls of a classroom. If you are observant and keen enough you can learn stuff by just observing things that happen around you. By saying this I do not mean that I am supporting child labor. I personally feel that this kid deserves to be educated. He who has such a good learning ability will do wonders if he gets an opportunity to get educated. I am of the view that this guy puts a question mark on the education system that we have. Don’t you feel that we lay too much emphasis on bookish knowledge? We train our kids to mug up answers to questions and write it down during exams. Whether they have actually understood what they have learnt simply doesn’t matter. Application is not given any significance. Least attention is given to the practical side of learning. On the other hand, here is a kid who has not been to any classroom and yet manages to speak so many languages. Just look at ourselves. We would be so bothered about achieving perfection and stress ourselves out thinking about how people would react to what we say or do. Will they make fun of us? Ravi is a great example for every one of us to follow. I liked the confident manner in which he was talking. I wish someday he will make it big. His name is Ravi, which means Sun in Hindi. I truly feel it is an apt name for him. He definitely shines bright like the Sun. I express my gratitude to sufiwindsurfing (youtube member who uploaded the video) and youtube.